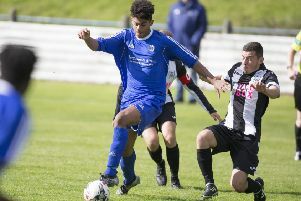 Hawick Waverley players Davis Hope, left, and Dean McColm (archive image). Although not exactly giving a five-star performance, Hawick Waverley nevertheless rattled away five goals to earn full points. Unbeaten in the league this term, Waverley began in a business-like manner and almost took the lead in the second minute. Grant Gass beat Langholm keeper Ryan Cuthbert with a header, only to see his effort booted off the goal line by Brian Mattinson. Following this, Mattinson had a chance to switch from goal saver to scorer in taking a penalty after Waverley’s Davis Hope handled in the box. There was to be no honour for the Legion man, though, as his spot kick was well saved by Hawick keeper Ali Willison. In the 11th minute, the hosts took the lead, as Taylor Hope polished off a good passing move involving Greg Ford and Dean McColm to perfection with a well-placed shot. 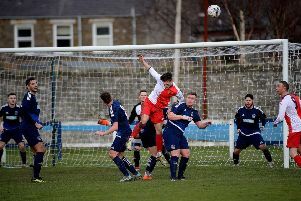 Playing into a strong swirling wind, Langholm came storming back to equalise a minute later when Daniel Winter burst through to lob the ball over Willison’s head or a well-taken goal. Davis Hope then came near to restoring Waverley’s lead by sending a header narrowly over the bar from a McColm free kick. With 28 minutes gone, Langholm edged ahead. Andrew Paisley emerged as their marksman with a run down the right before blasting home an angled drive. In the 33rd minute, Waverley grabbed an equaliser. Defender Jamie Richardson met a Taylor Hope free kick that the Langholm defence had failed to clear. Back came Langholm and the woodwork came to Waverley’s aid when a Mattinson drive cannoned off the upright. With four minutes of the second half gone, Jordan Yardley put Waverley in front and, from here on, the pattern of the game was to change. Langholm, who had shown up so well during the first half despite facing the elements, faded out of the match. Waverley, on the other hand, began to make their mark and, in the 59 th minute, got a fourth,courtesy of an own goal. Yardley then made it five by netting in the 76th minute after Ryan Clapperton had done the spade work. Waverley’s longest serving player, Jamie Richardson, said: “We might not have been at our best but we got a win, and it was a deserved one. “Langholm, who are the only side to have taken a point off us this season, played well in the first half. “In the second half, I thought they tired a bit, while we got stronger. We have a good bench and this means a lot.